Every morning, the fine folks at Sports Radio Interviews sift through the a.m. drive-time chatter to bring you the best interviews with coaches, players, and personalities across the sports landscape. Today: Giroux kind of has to say that. Philadelphia Flyers center Claude Giroux joined Mike Missanelli on 97.5 The Fanatic to talk about the NHL 2013 cover (which he's up for in a fan voting contest), the 2012 Stanley Cup Finals and his goalie, Ilya Bryzgalov. "It's something that I've never really thought of and now that I have a chance to actually win it, it's pretty cool. I've been lucky enough to have the support of all the fans and hopefully I can actually win this." "I think that's more for Madden I think, but that's what I want to think anyway." "I actually don't really own a Playstation or an XBox but Brayden Schenn was my roommate this year and he had an Xbox so we used to play once in a while. But I'm not a big gamer." "No, I don't have the casts. It's been probably a week now so I can actually move a little bit. But, actually today was my first day training. It was just lower-body because I can't grip, but it's getting a lot better. I'm looking forward to getting back 100 percent." "I'll be honest with you, I haven't watched a game since we were out, so I dunno, it's just so painful to watch the other teams play when you actually believe that you should be there instead of them." "If you don't know what to expect coming into Philly, it's not like in Phoenix (where) they don't have a lot of media and stuff. 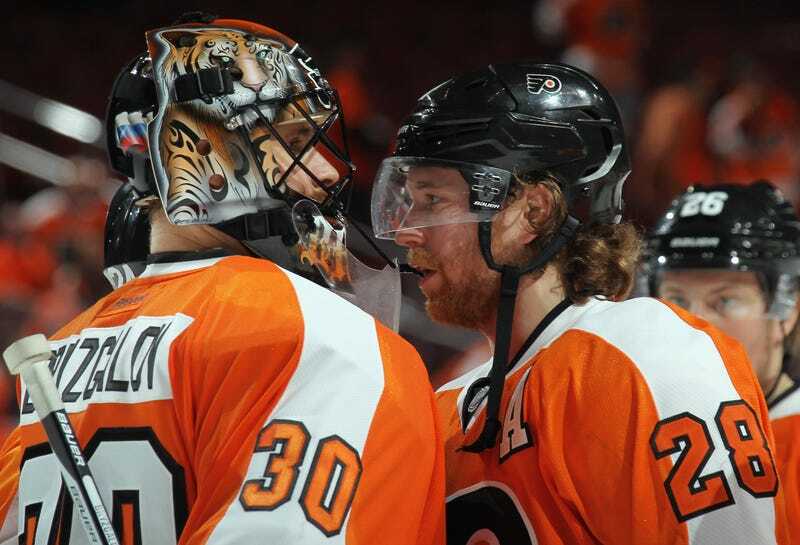 It's Philly, everybody's a big Flyers fan and it's great. … He didn't know how it would be, but at the end of the season, like you said, he kind of adapted himself and he was good with the fans and he was playing his best hockey at the end, too. Obviously next year he's gonna know what to expect and if I had to predict anything he's gonna be the best goalie in the league next year. … I'm pretty sure that's what's gonna happen." • Mike Woodson is glad the Knicks didn't call Phil Jackson. • Brandon Stokley is already on the same page as Peyton Manning. • Chipper Jones calls Andruw Jones the best young player he's ever seen.